It was Mother's Day here in France yesterday. That meant I had control of the remote from 3.15pm and could watch France 2's coverage of the Jubilee Pageant. My Sky Digibox couldn't capture the satellite image for the BBC although Channel 4 was beaming out perfectly. I was not pleased at being obliged to listen to the inane rubbish being spouted out of France 2 but from what I've read in comments on The Times and Telegraph online, the BBC made a bit of a hash of things too. Nothing could detract from the splendour of the spectacle though. I loved to see the Queen looking so happy as she approached the magnificently decorated Royal Barge, the Spirit of Chartwell. Sixty years on the throne is worth celebrating and apparently more than a million people watched the Queen from the banks of the Thames, braving the cold, wind and rain of a typical day in June. 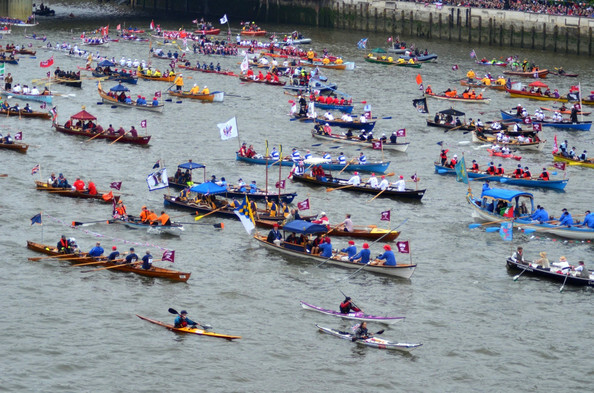 From the comfort of my sofa, cup of tea in hand, I watched as the boats started off, first the rowers, all rowing against the tide and with a couple hours of rowing ahead of them but all with huge smiles on their faces and obviously proud to be part of the flotilla. Seeing the Queen resplendent and happy, the huge number of boats participating, and the crowds lining the Thames, I felt so proud that us Brits can pull off such a joyful show. Despite the weather, everyone was together with everyone else, all there for one person, to celebrate the amazing feat of sixty years on the throne. It brought more than one tear to my eye. Back on the tele what I missed from the commentary was information about the boats and the background to some of the more historical ones. There was a line of people sending out a message by semaphore - what did it mean? No one knew. Apparently no one knew on the BBC either - shame on them! Instead, France 2 gave us Karl Lagerfeld who sketched a picture of the Queen in a cape which he thought would have been a better choice against the elements than the shawl she had. He gave it a nautical touch in honour of the flotilla. There were several interviews from the Belem, a French sailing yacht which was moored so far down stream that the Royal Barge didn't actually pass in front of it, but they caught a glimpse from afar. We also got an interview with a couple of musicians outside a pub in Piccadilly who gave a rendition of 'Daisy Daisy' on their accordions. That morning, Europe1 invited the British Ambassador for an interview on the radio to talk about the Queen and the Jubilee. One journalist distinguished herself by asking the Ambassador if the Queen wasn't just a 'potiche' which is a pejorative term for 'figurehead'. I hope she got a bollocking for her complete lack of respect and professionalism. It certainly shocked some of the listeners. The Ambassador ignored the jibe and answered question. France 2's coverage didn't extend to the fireworks off Tower Bridge so I didn't see that. The French called it a day when the Spirit of Chartwell docked, and my youngest who had sat through much of the spectacle upside down on the sofa could happily right himself and get back to the XBox. My day ended with a special Mother's Day chicken bought at vast expense from the butcher's. My eldest roasted it with instruction from me, with roast potatoes and broccoli. It was a lovely dinner, but no tastier than the usual Red Label chicken I get from the supermarket. I won't be buying a butcher chicken again but at least my son now knows how to cook a chicken and roast potatoes. We finished off with strawberries from the garden and sweet juicy mango. Definitely a Mother's Day to remember.